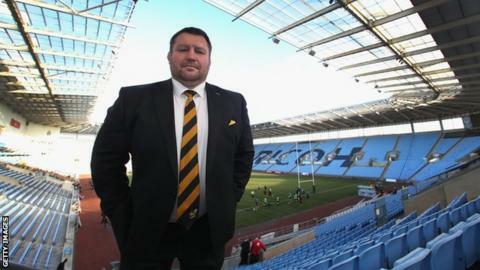 Wasps boss Dai Young says their move to the Ricoh Arena in Coventry gives them the ideal chance to secure a regular place in the European Champions Cup. "It's going to be a great motivational factor for us," director of rugby Young, 47, told BBC Midlands Today. Wasps are currently seventh in the Premiership, just outside the automatic European qualification places, and Young is adamant the club can only benefit from their switch to the Midlands. "It's an exciting chapter about to open here," he said. "The players are really excited - when you come and walk around you can't help but be impressed and excited. I won't have to say too much to them. "It's hugely important for us to be in that top six again." The twice former Heineken Cup winners are still in contention to make the knock-out phase of this season's Champions Cup with two pool matches to go. They are a point behind leaders Harlequins and Leinster, in second, after two wins and two defeats so far. The club's decision to re-locate from High Wycombe to Coventry triggered speculation on how the move would impact Coventry City Football Club and the city's long-established rugby side. "It's not going to be a big issue for us," said Coventry chairman Jon Sharpe. "They play their games on a Sunday so there's no direct overlap with us and that's the case for the rest of this season and the whole of next." Coventry are hoping to strike up an agreement with Wasps that could see a number of the Premiership's younger players come to the Butts Park Arena on loan - something Young is not ruling out either. "We want to work together with them, we don't see ourselves as competitors," he said. "They are not a feeder club - that's disrespectful. They're a big club in their own right and there are obvious cross-overs and benefits we can share."